"Privacy Today: United States and International Legal Perspectives" by Michael Aktipis, Marguerite C. Walter et al. 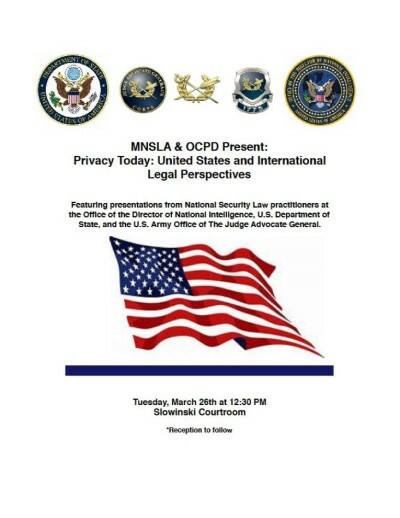 On March 26, 2019, MNSLA and OCPD hosted a "Privacy Today: United States and International Legal Perspectives” panel. Panelists included: Michael Aktipis, attorney in the Office of the Legal Advisor at the U.S. Department of State in Washington DC; Marguerite C. Walter, attorney in the Office of the Legal Advisor at the U.S. Department of State in Washington DC; and COL Paul Golden, U.S. Army War College Fellow assigned to the Office of General Counsel at the Office of the Director of National Intelligence in Washington, DC. Colonel (Retired) Richard Pregent, who served as a Judge Advocate for nearly thirty years, moderated the event. Aktipis, Michael; Walter, Marguerite C.; Golden, Paul; and Pregent, Richard, "Privacy Today: United States and International Legal Perspectives" (2019). Other Lectures & Events. 18.